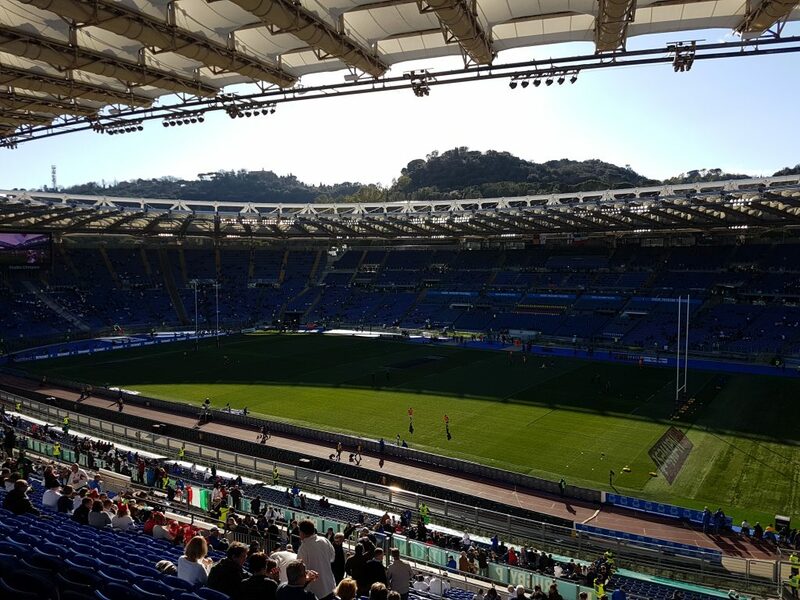 The opening fixture of the 2018 Six Nations saw England make the short hop over to the Stadio Olimpico in Rome on the 4th February. Over 70 guests joined us for our 2-day rugby experience in the Italian capital, with most extending their stay to take in more of the sights the historical city had to offer. From the Colosseum to the Trevi Fountain, Piazza Navona to the Vatican there is certainly a lot to pack into a weekend in Rome. 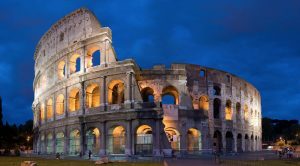 Included in the package was 2 nights’ accommodation at the impressive 5* Rome Cavalieri Waldorf Astoria, two match tickets for the rugby, a signed Martin Johnson display and a tour of the famous colosseum. The weekend started with check in at the hotel where guests were greeted by the team and were handed their match tickets, confirmation of their Colosseum tour time and were given a quick overview of the hotel location in relation to various sightseeing attractions (and of course the tried and tested bars and restaurants). Guests were offered a complimentary drink as they settled in to their luxury surroundings and were quick to compliment the jaw dropping Italian decor in the lobby of the Rome Cavalieri – certainly a hotel which makes a great first impression! Guest arrival was staggered, with the first arrivals on Friday, but most joining on the Saturday, the day before the game. Guests chose from several different tour times for their colosseum experience, with some opting to take the tour on the day of arrival and others on the day following the rugby. Each day, the Impulse team were on hand at the designated location to ensure guests were booked on their allotted tour times and to liaise with our local tour guides ‘Italy With Us’. Once ‘mic’d up’ our tour guides led guests off to the VIP entrance to be immersed in history, learn about the Roman Empire and visit the amphitheatre, one of the world’s most famous monuments. Sunday 3rd February saw England open their Six Nation’s campaign and the weather was definitely on our side. After a few days of rain, guests were delighted by the bright sunshine and clear blue skies on the day of the big game, albeit a slightly chilly day. Exactly the conditions that make for excellent rugby! Before the game, guests had the opportunity to mingle with fans from both sides, with plenty of food and drink stalls dotted around the ground to keep people entertained. With the sunshine beating down and the anticipation of rugby in the air, the crowds started to build up and guests made their way inside the ground to their seats. What followed was an entertaining display of rugby by England and an emphatic 15-46 win, with George Ford and Owen Farrell showcasing some impressive moves which left Italy’s defence in tatters. Unfortunately, this performance was not one that was matched in any other game of the 2018 campaign! As the final whistle blew, the stadium quickly emptied and guests either made their way back to the hotel or took a short taxi ride into the centre of Rome for some food and drinks to finish off their day. A very enjoyable but tiring Sunday! Bright and early on Monday a small group of guests had booked onto the Colosseum tour so were greeted at the meeting point and led down to the entrance to start their tour. Others spent a relaxing day wondering the cobbled streets while they waited for their transfers to the airport. With a great win for England, perfect weather for the rugby and some fantastic feedback from the guests, our 2018 Rome Rugby Experience certainly was a massive success. If you’d be interested in travelling with us to Ireland in 2019 to watch England take on the Irish at the Aviva stadium – get in touch! We have a fantastic experience on offer – with two nights accommodation, a tour of the Guinness Factory and of course two tickets to watch Ireland v England. For more information or to book, please get in touch on sales@impulsedecisions.com or call 01423 531 682.